This dish used to be my go-to, only-thing-I-was-confident-enough-to-serve-to-others dish. Not sure what happened, but I don’t think I’d made it in a few years. It’s still just as good, sweet, and fruity as before. It’s also easy – not much hands-on time. 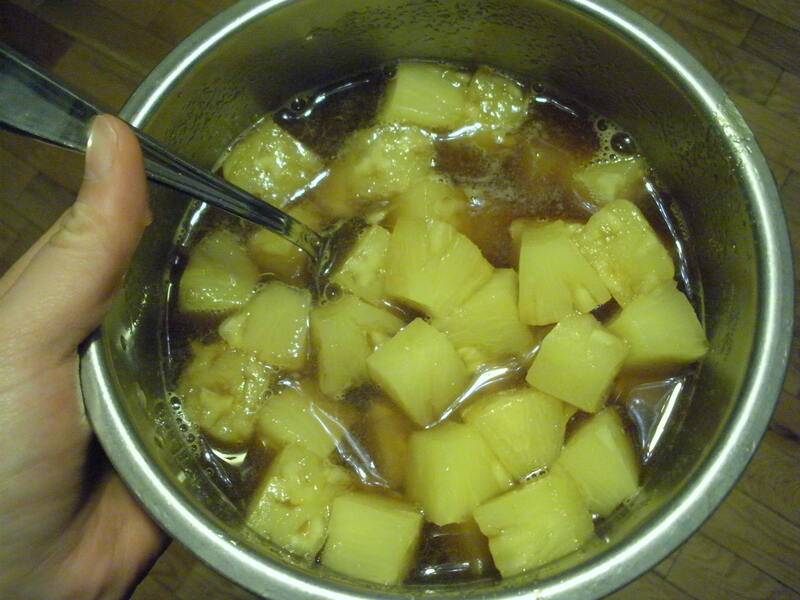 Start off by combining a can of pineapple chunks with a bunch of brown sugar, and stirring until the sugar is dissolved in the pineapple juice. Mmm, sugar! Hah, did you know both my parents are dentists? Place your chicken breasts in an 8X8″ baking dish. Cut off any particularly massive/offensive chunks of fat, but otherwise leave the breasts whole. Pour the pineapple/brown sugar mixture over the chicken. This will be delicious so soon! Throw it in the oven for 55 minutes, get some rice cooking as well, and take a quick nap. Or make a side? 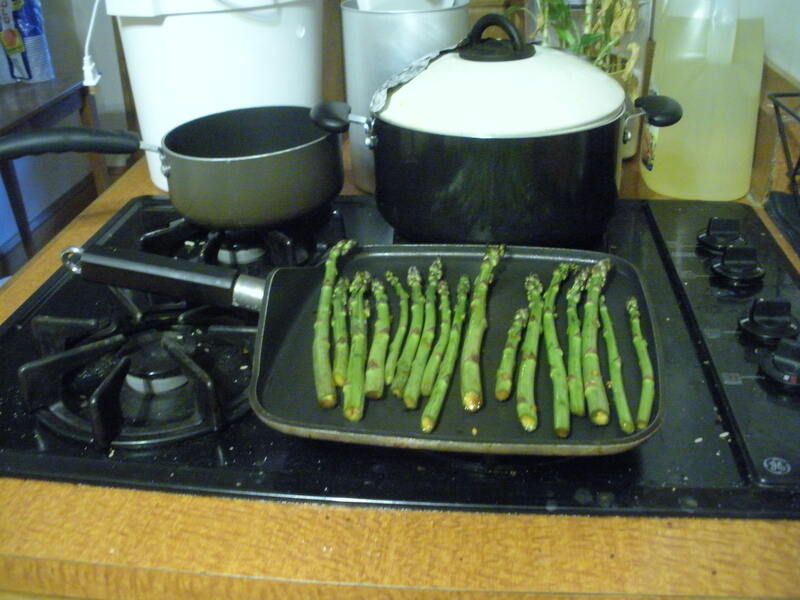 I marinated some asparagus in soy sauce with garlic for a few hours earlier that day, and just cooked that on a flat pan towards the end of the 55 minute, but feel free to do something fancier. Once the chicken is done cooking, carefully (not because this is important or easy to mess up, just because you don’t want to burn yourself) pour off the pineapple juice into a pot. It’s ok if a few chunks of pineapple go into the pot, but try to keep them mostly in the dish with the chicken. Throw some foil over the chicken and pineapple to keep it warm, and put it aside for a minute. 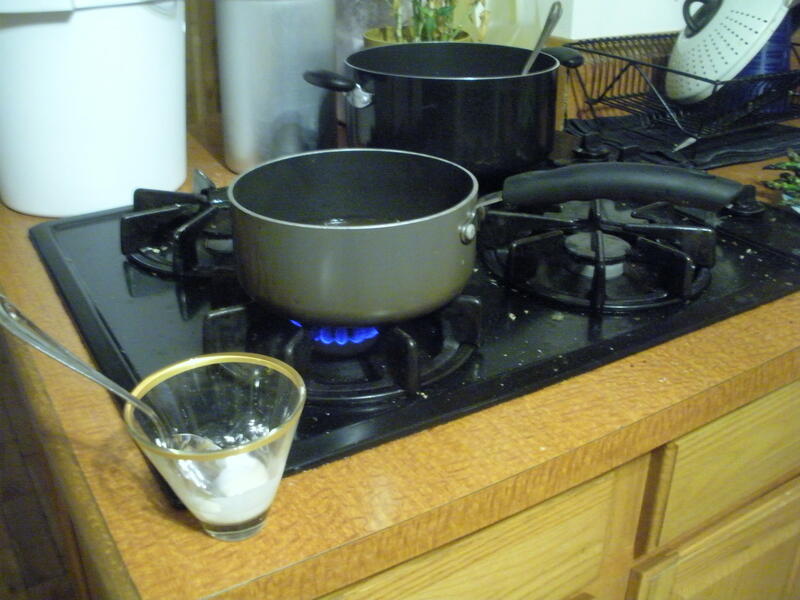 Put the pineapple juice pot on the stove, and heat over medium high heat, stirring frequently and using cornstarch to thicken to a consistency you like. I aim for duck sauce-esque. If you’re not too familiar with cornstarch, don’t pour the powder straight from the box into anything you’re trying to thicken – it’ll just clump up. Instead, put a tablespoon or so (really, don’t bother measuring, it’s not that important) in a cup and mix in a small amount of cold water – just enough to be able to wet all the cornstarch. Stir that up, and then spoon into the liquid you’re thickening and it’ll do the job. 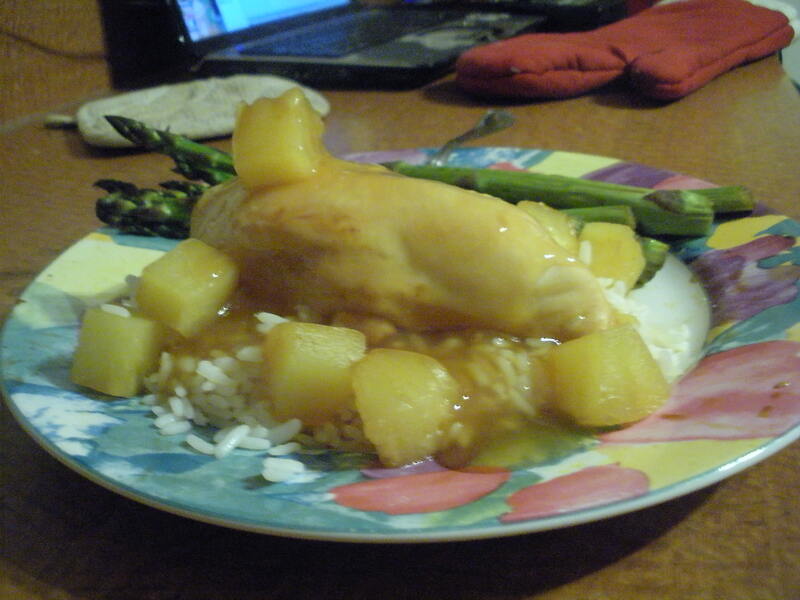 Serve the chicken and pineapple over rice, and top with the pineapple sauce you just made. Yum! So many food groups, it must be good for you! Preheat oven to 350 degrees. Combine brown sugar and pineapple in medium bowl and stir to dissolve sugar. Cut any excessive fat chunks off chicken and then place the breasts in an 8X8″ baking dish. 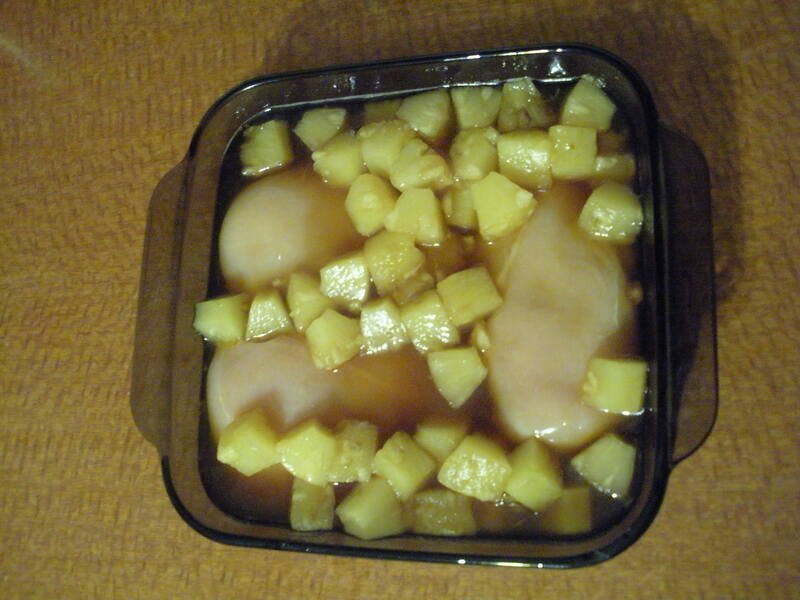 Pour the pineapple mixture over the chicken and bake 50-55 minutes or until lightly golden. Remove chicken from oven and pour pineapple juice into pot. Tent chicken with foil and set aside. Heat juice over medium high heat on the stove and thicken with cornstarch. Serve chicken over rice, and top with pineapple sauce. This entry was posted in Dinner and tagged Brown Sugar, Chicken, Pineapple. Bookmark the permalink. Quick and easy is the best way to do dinner. I tend to be starving by about 4:30, so…complex dinners are really weekend only. I remember when you mad this chicken for me. It was delicious. Oooh yeah, that did happen once! And chicken and broccoli once at Tufts, and that enchilada lasagna on Mothers’ Day… At this rate it’ll only be 2 1/2 years until the next time I cook for you! At Easter dinner at my friend Megan’s house, her dad made Asparagus in the oven with Mandarin Oranges (in syrup). 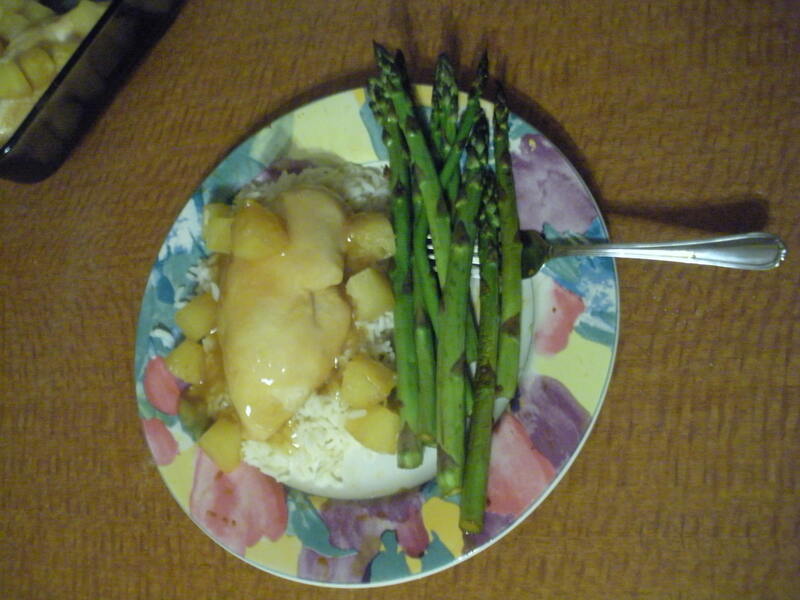 It might be too much fruitiness to go with this chicken, but it was sooo good! Ooh, yeah, I might not put that with this meal, but I’d definitely try it in general!